Mercedes Benz will be launching its least priced high performance AMG badged car, the CLA 45 AMG sedan, in India on the 22nd of July. The car was recently caught on test in the country post an official showcasing at the Auto Expo 2014 earlier this year. The pocket size powerhouse will be brought into the country through the Completely Built Unit (CBU) route like other AMG cars and is expected to get a price tag of around Rs. 60-70 lakhs courtesy our steep import duties for full imports. The CLA 45 AMG is powered by a 2 liter turbo charged petrol engine that is the most powerful four cylinder petrol motor in the world. 360 Bhp of brute power coupled with a peak torque of 450 Nm is the what will guarantee a solid punch that pushes you back to the seat each time you mash the loud pedal. The motor is mated to a 7-speed AMG SPEEDSHIFT DCT (dual clutch automatic transmission) that transmits all the torque to all four wheels of the sedan. There are three drive modes on offer and the highlight of these modes is the “Race Start” mode, which allows one to make clean starts at maximum torque for some blistering acceleration. The top speed of the car has been restricted to 250 kmph and the CLA 45 AMG will do the 0-100 kmph sprint in only 4.6 seconds. Visual highlights on the car includes the AMG kit that makes its presence on both the outside and inside. 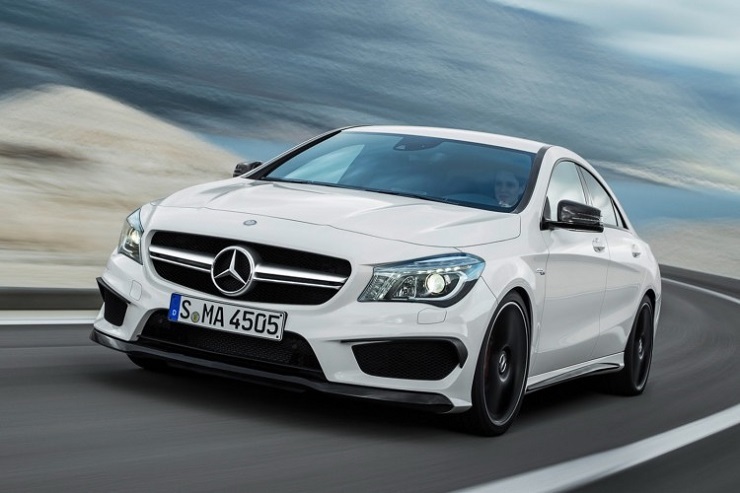 Mercedes will also bring the regular CLA sedan next year to capitalize on the entry level luxury car market.